Oh my Marrakech. This city is craziness especially compared to the developed major cities in Europe that we had been traveling to. 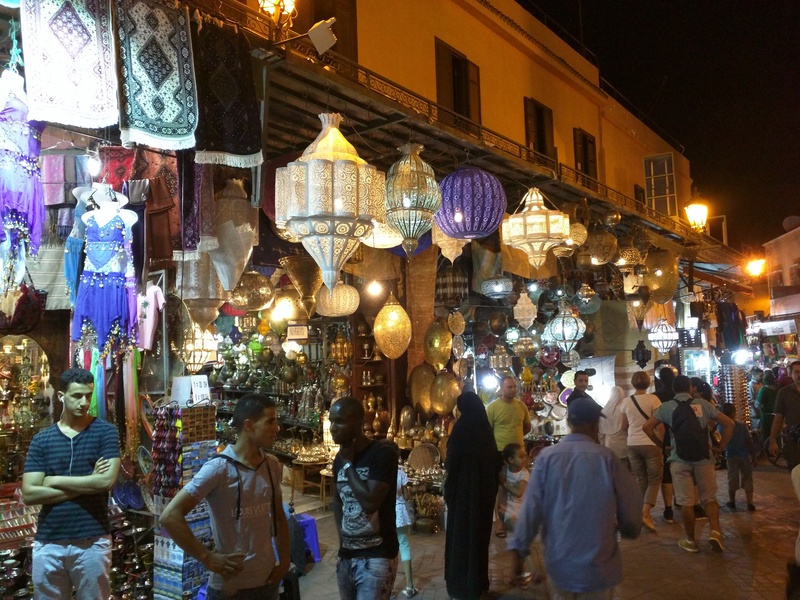 Coming to Marrakech was a good change and so much different than where we had been that it definitely made for an adventure. 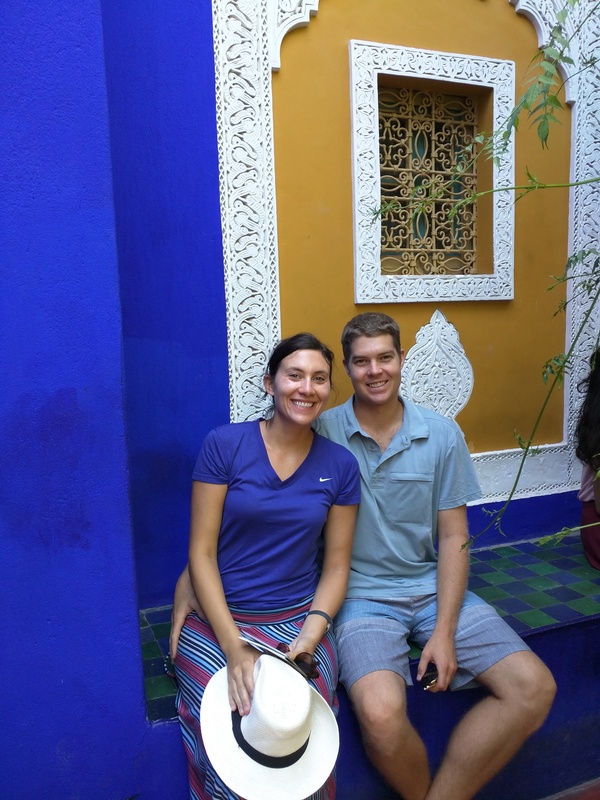 To get a real Moroccan experience we decided to stay at a Riad which is basically like staying at someone’s home except fancier. Staying at Riad Tammarakech was great, the owners were so helpful in giving directions (which you need because there are no street signs and the Medina, the old city, is full of windy streets so you have no idea where they lead to), giving tips on how to not get hassled or ripped off, booking tours, and they made a great breakfast. 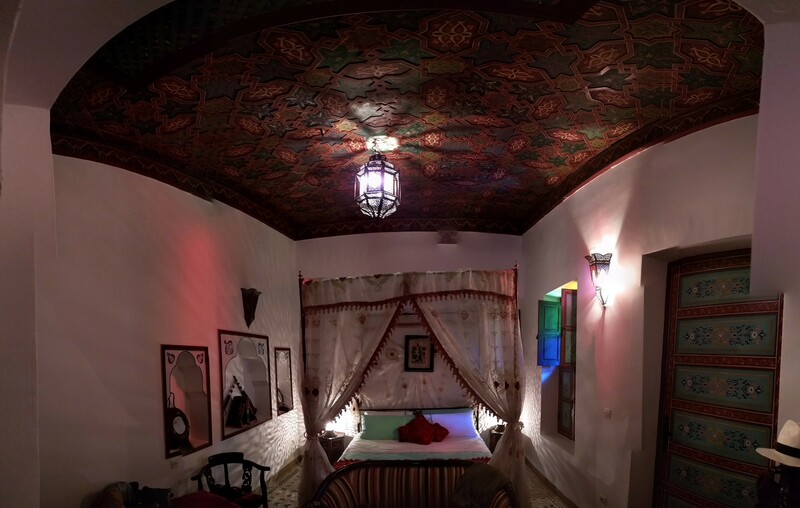 You also got to stay in a really cool Moroccan decorated room. Room at Riad. 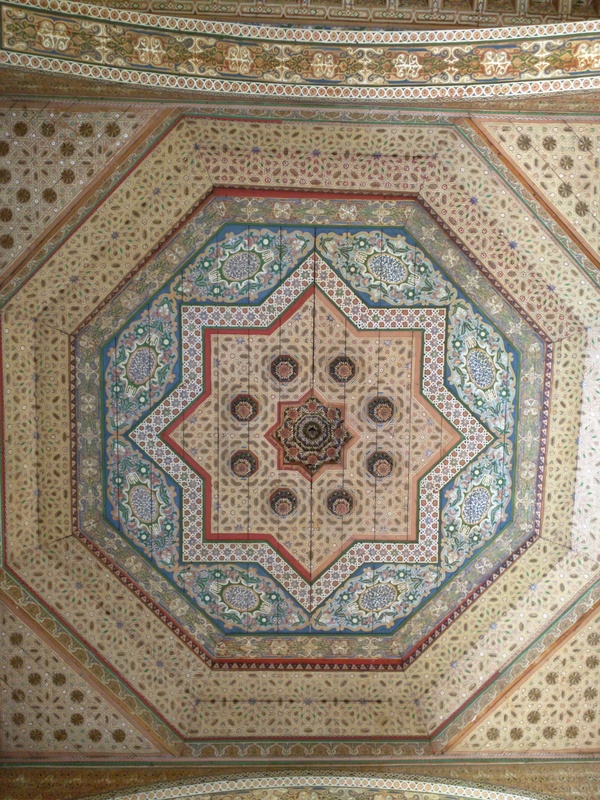 Check out the awesome painted ceiling. Very arabian. 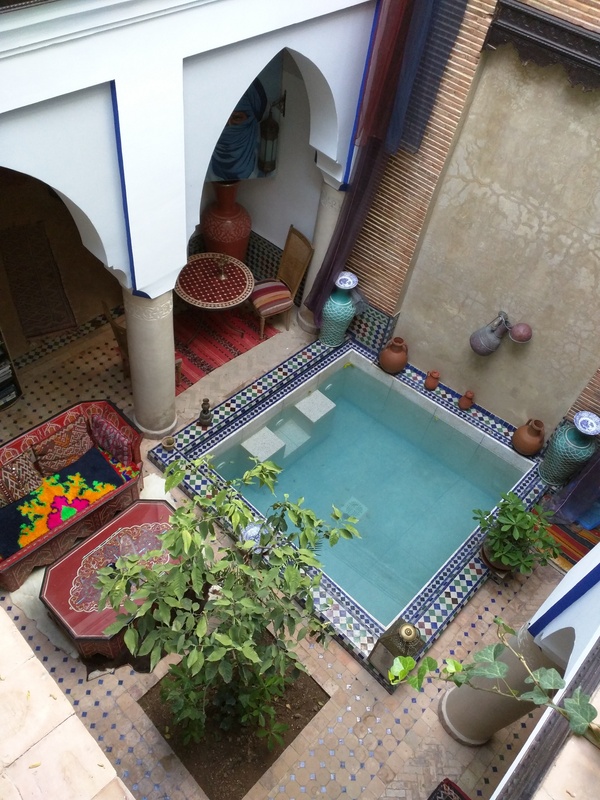 Most riad’s have a pool in the center to keep the building cool. The fountain also runs most of the day so you have a nice relaxing water sound. We got into Marrakech in the afternoon and getting off the airplane we got the immediate shock of seeing a fully loaded 747 from Saudi Arabia unloading it’s passengers onto the runway. You immediately knew you were in a new place because you saw women wearing the traditional burka and hijabs and men wearing long tunics and turbans. They were all coming from Saudi Arabia because it was the end of Ramadan and they were most likely spending the holiday in Mecca. I was worried about how I was supposed to dress as a women in a Muslim country and opted to make sure I wore shirts that covered my shoulders and pants or dresses to cover me knees. 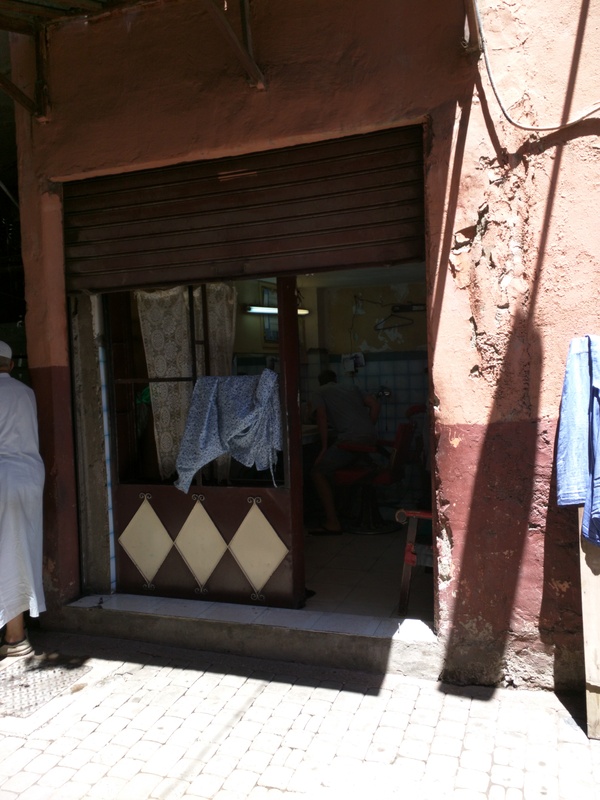 You do see a wide variety of dress in Marrakech and the tourists will wear whatever they want but I decided to try and be respectful of their traditions and I didn’t want to be stared at by the men so I took the more conservative route. Once we got to the Riad our host recommended that we try to find the main square, Jemma-el Fnaa, in the daylight because it will look totally different at night and people will try and get you to go the wrong way or take you to the tannery and get suckered into buying something else or paying them for being a guide. Once we made it to the square without getting run over by one of the many motor bikes, scooters, or donkey carts flying past us you run into tons of stores, restaurants, orange juice vendors, snake charmers, and monkey wranglers. Yea you heard me there are cobra snake charmers in the square and a bunch of guys that have monkeys on leashes. 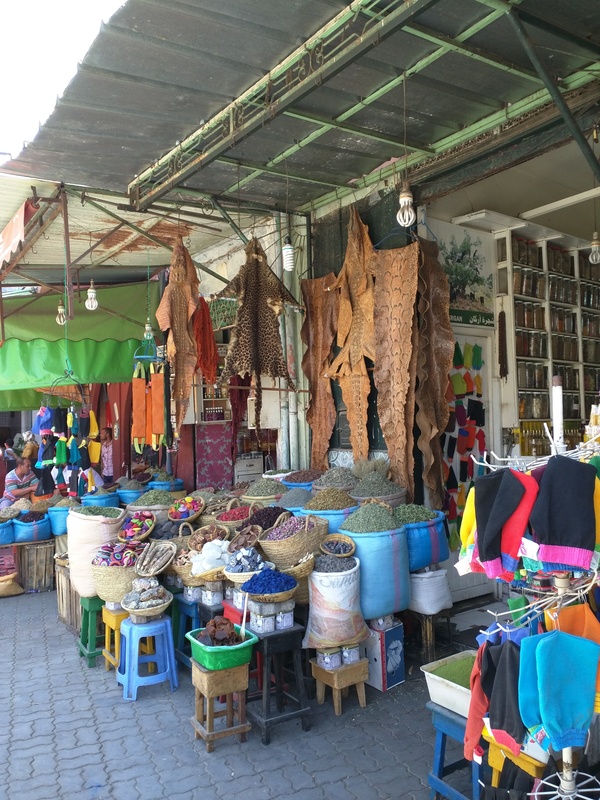 Spices and pelts at the souks. Camel! We finally saw one our last night walking the streets. 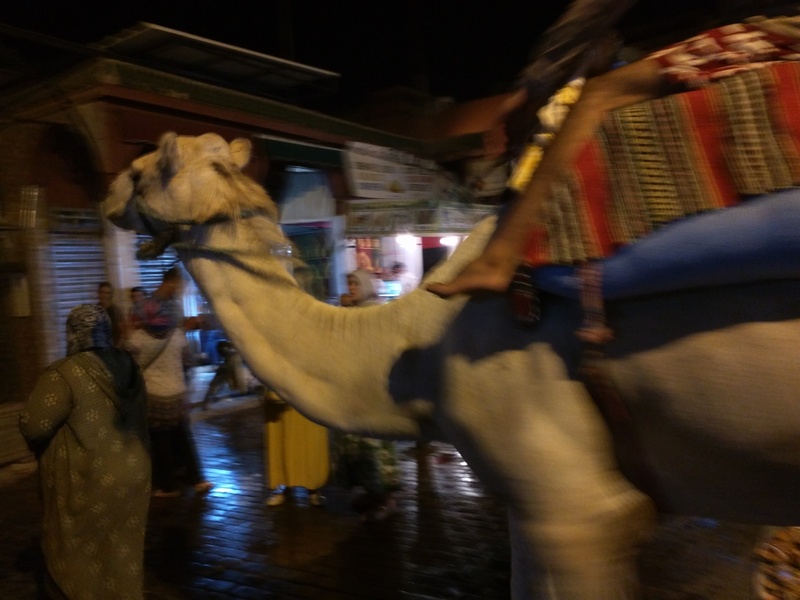 That night we decided to venture back to the main square, Jemma-el Fnaa, and it had completely changed. There were a ton a new stands that had been set up with street food and it was packed with locals and tourists. The stalls aren’t named they are only numbered and from some of our research we knew a few numbered stalls we wanted to try. Dan the adventurous eater that he is decided to try a bowl of snails in broth which he said were pretty tasty (also he didn’t end of getting sick so I guess they were good). This was one of the few stands where locals were eating. Apparently Moroccan’s don’t eat out very often so this is one of the few times you will find them out to dinner. So most stalls here are catering to tourists with kebabs, tagine, etc. and really try to hassle you to come into their stall. We didn’t really want to be at a stall that only had a bunch of tourists eating at it so we settled for number 31 that had a ton of Moroccan’s eating and a line. Everyone here was eating a plate of lamb sausages about 3 inches long that was served with a plate of basically blended tomato and a pita. These weiners were delish! I would definitely recommend eating at stall 31. After weiners I wanted some mint tea. Which is awesome is Morocco! It is only mint steeped in water and sugar is added. This stuff is my favorite. Once we were stuffed with street food we ventured into the center of the square where there were a ton of street performers, games, and henna artists. I got conned into a henna tattoo by a women who grabbed my hand, told me I had nice hands and then proceeded to give me a hand henna tat. I tried to resist but she kept saying “it is for free, for good luck” (we all know this was not for free). Once she finished and we tried to walk away we were of course guilted into paying her. I wanted a henna while in Morocco so I guess it all worked out. 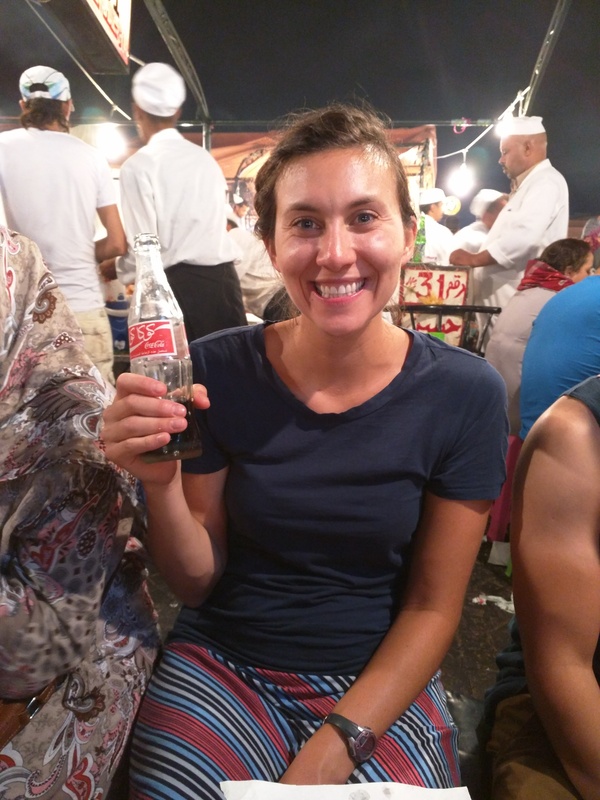 Kristni with arabian coke at the lamb weiner stand. Yea 31!! The next day we set out to see the northern part of the old city which included the Ben Youssef Medersa and the Photography Museum. The Ben Youssef Medersa (10 diram/person) was one of the first schools in Marrakech and is a place where you can see some traditional Moorish architecture. 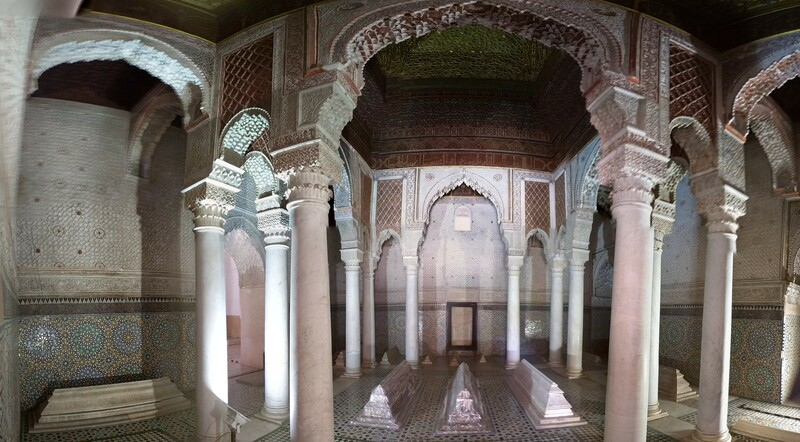 If you have extra time in Marrakech then I would recommend seeing this but leave it off your list because there are better places to see Moorish architecture in Marrakech like the Palace Bahia. After the Ben Youssef Medersa we headed to the Photography Museum (40 diram/person) which was really great. It had photos of Marrakech from the 1920’s and then a lot of photos and a documentary of the Berber people. This museum was a good mix of interesting photography and the history of Morocco. Also the photography museum has a great terrace where you can have some mint tea and look over the medina. 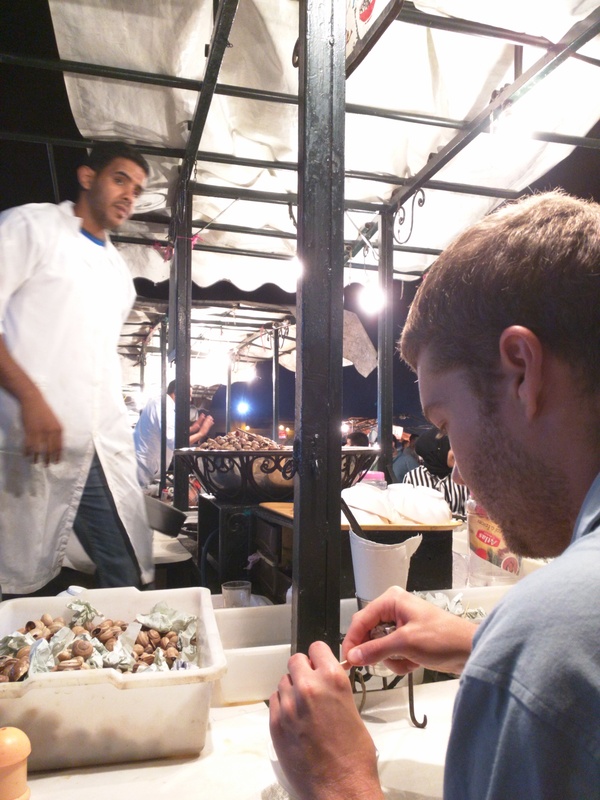 That night we were on the hunt for some good food because we had gotten some mediocre touristy food while in Marrakech. We came across a modern Moroccan restaurant called Nomad and we were so glad we did we ended up coming back a second night. The restaurant has outdoor seating on the terrace and excellent service. They even sell alcohol which his rare in Marrakech. (We didn’t partake because we wanted to do as the locals do and also needed a break from the booze from being in Spain and Portugal) Some standout dishes from both of our visits were the feta croquettes, hummus platter, nomad lamb burger, and saffron and argan oil ice cream. Another good restaurant shout out is the Souk Café which had great Moroccan food including an amazing appetizer that included 8 or so small dishes like peppers, tapenade, and eggplant. 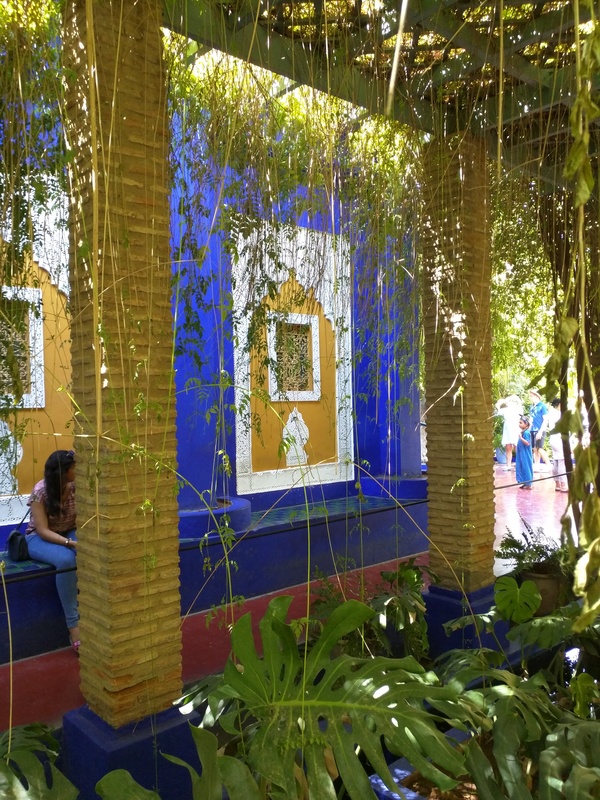 The second day in Marrakech was to see the southern part of the old city and Yves Saint Laurent’s Jardin Majorelle in the new city. The Jardin Majorelle was pretty pricey for what you got ($7) but was neat to see. They have some beautiful buildings painting an amazing blue color called Majorelle which I’m definitely bringing back to the states. It’s a quiet and clean place to escape the craziness of the medina. 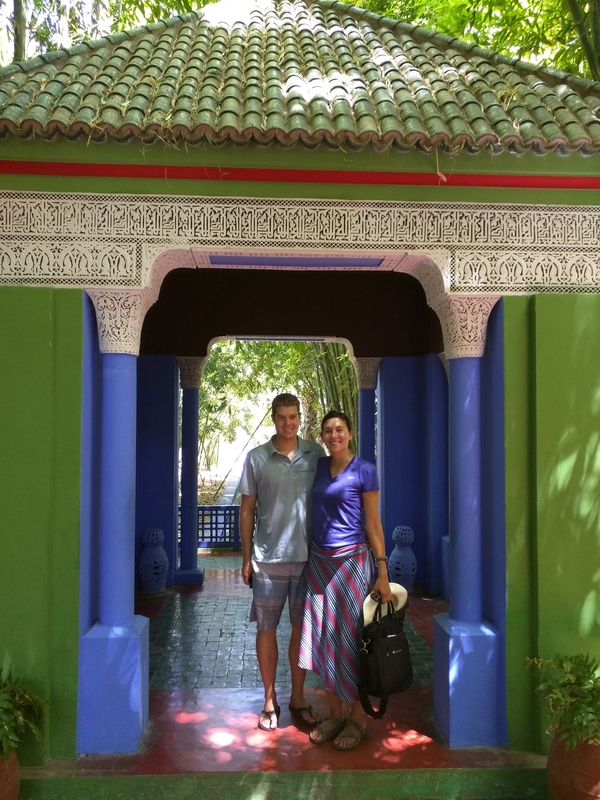 We also went to see the Tombs Saadian (10 diram) and Palace Bahia (10 diram). 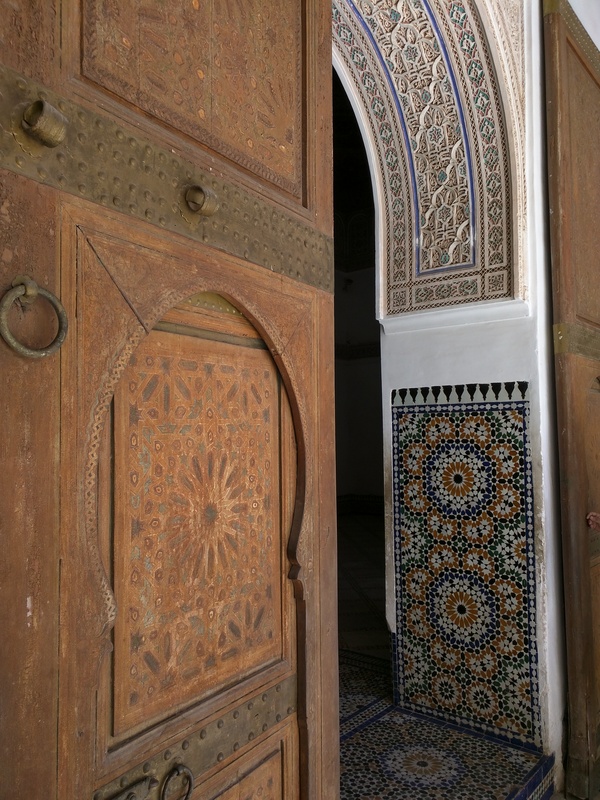 I would recommend seeing the Palace Bahia over the Ben Youssef Medersa because it is bigger and is a better example of the gorgeous Moorish architecture and amazing painting ceilings. 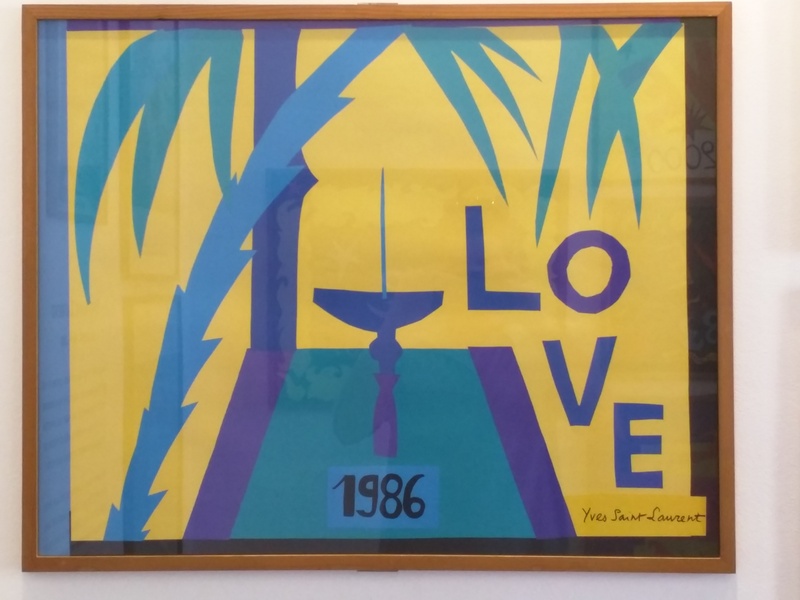 YSL made postcards every year and sent to his friends and family. Here is the one from 1986! 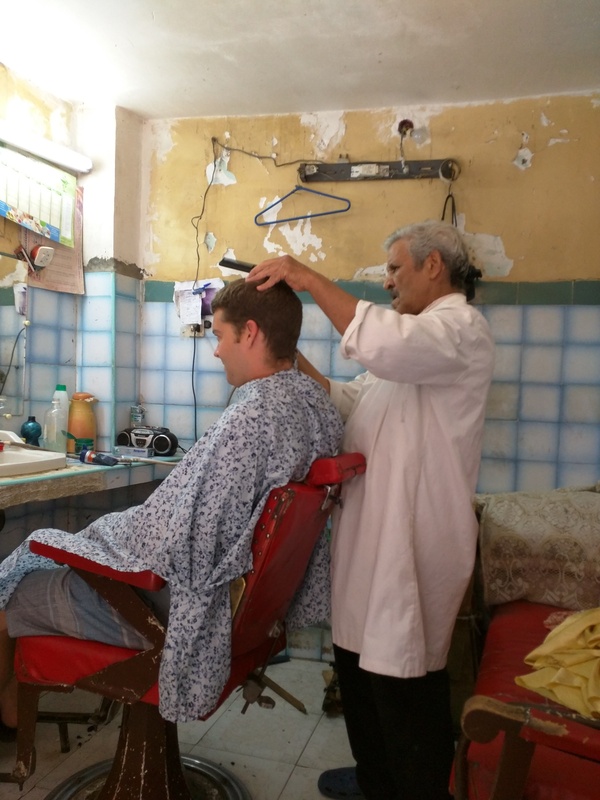 During our adventure Dan decided he was going to get his hair cut while in Marrakech and as we were walking through one of the streets an older man asked Dan if he needed a haircut and Dan thought it was fate. As we were walking into the “salon” another guy who just got his haircut was leaving and told us that “the guy was a little crazy but it was alright” although we were a little skeptical with this interesting warning Dan went for it any way. As Dan sat down in the barber chair and the man started cutting his hair we realized that the older gentlemen was a little more than crazy. He started cutting Dan’s hair but his hands were shaking so bad that the clipper guards kept falling off and Dan just ended up getting an uneven buzz cut. After this ordeal the barber ended up asking Dan if he wanted a straight razor shave which he declined immediately. The whole encounter was quite interesting and I only had to fix a few places from the uneven cut. 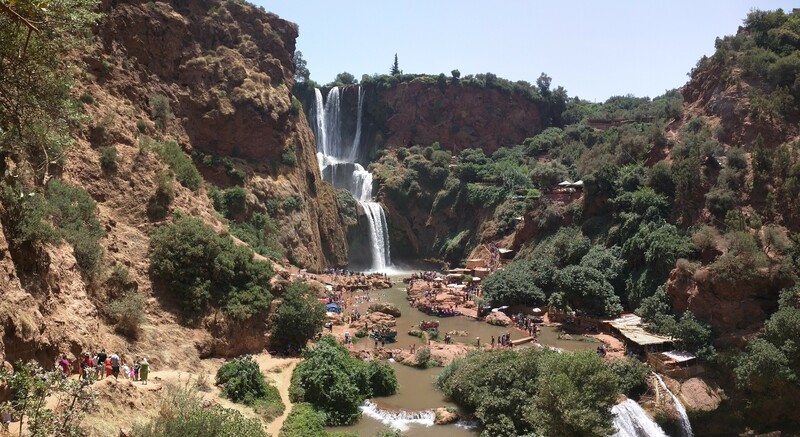 The last day in Marrakech was supposed to be a scorcher, like 110 F, so we opted to go on an excursion to these big waterfalls, Ouzoud Cascades, in the Atlas mountains about 2.5 hours outside of Marrakech. 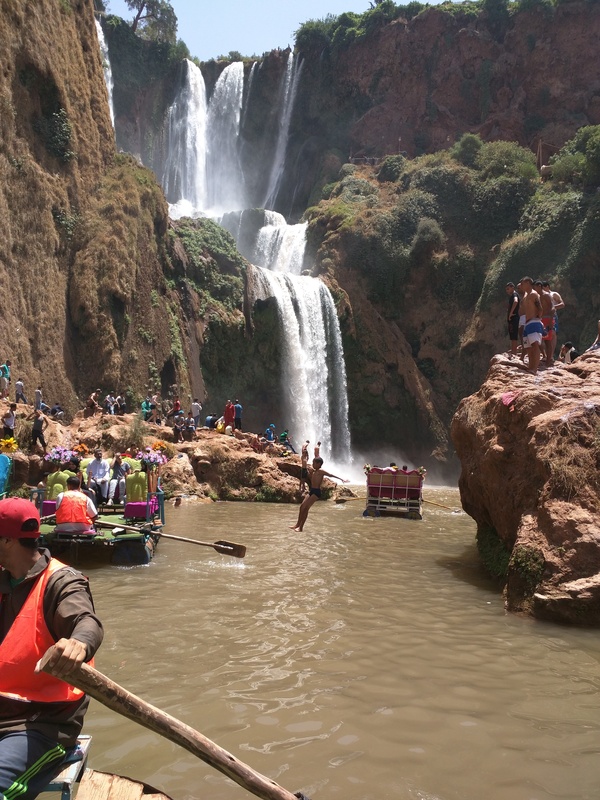 This excursion was really fun and there were a ton of local Moroccan’s there who come to camp and escape the heat. We got to swim in the river and then took a hilarious paddle boat to right under the falls which was refreshing from the heat. 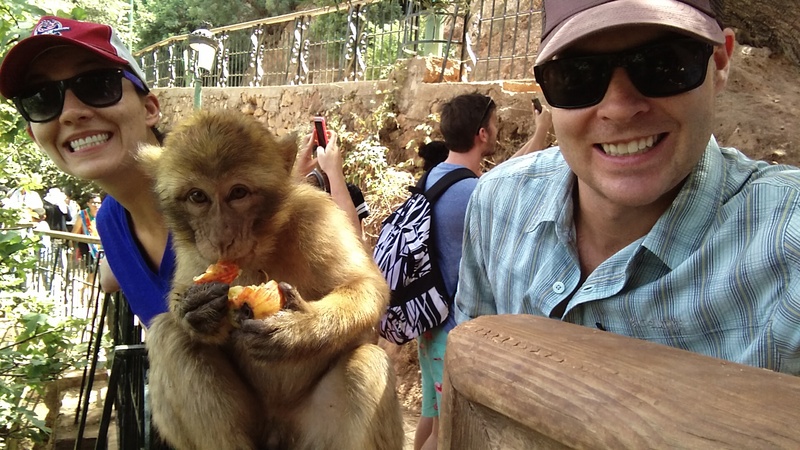 We even got to take a selfie with some monkies! Overall we are really glad to see Marrakech and get to Africa. 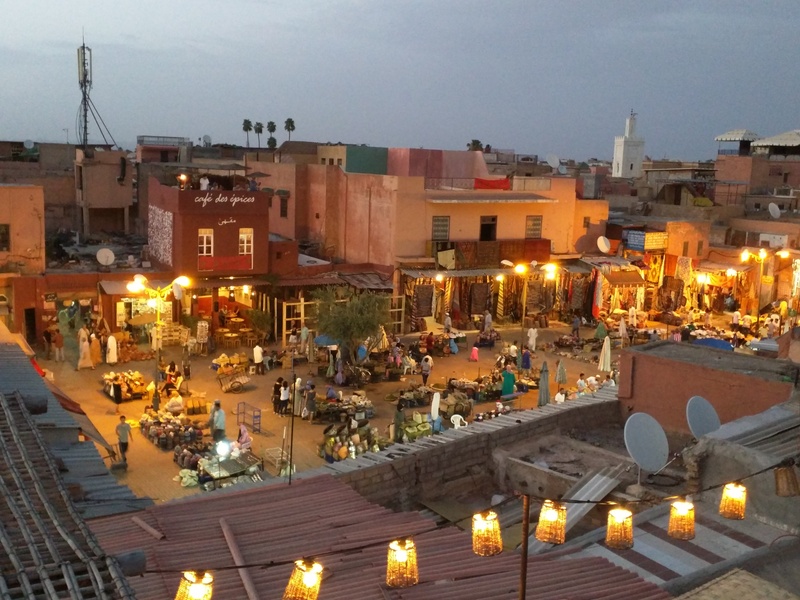 Dan and my biggest complaint about Marrakech was feeling like the locals were trying to scam you. From them telling us outrageous prices for things (you have to barter for everything and they start with more than double what you should pay), trying to tell us we were going the wrong the direction (they are constantly telling you that the tannery is the other direction and it’s the last day the Berber’s are there), and getting harassed to eat at their restaurant, buy their goods, or go on a tour you had the overall feeling of getting hassled constantly. Other than that if you are near Marrakech its worth a couple days to see a different kind of place! Take a day trip away from the city. 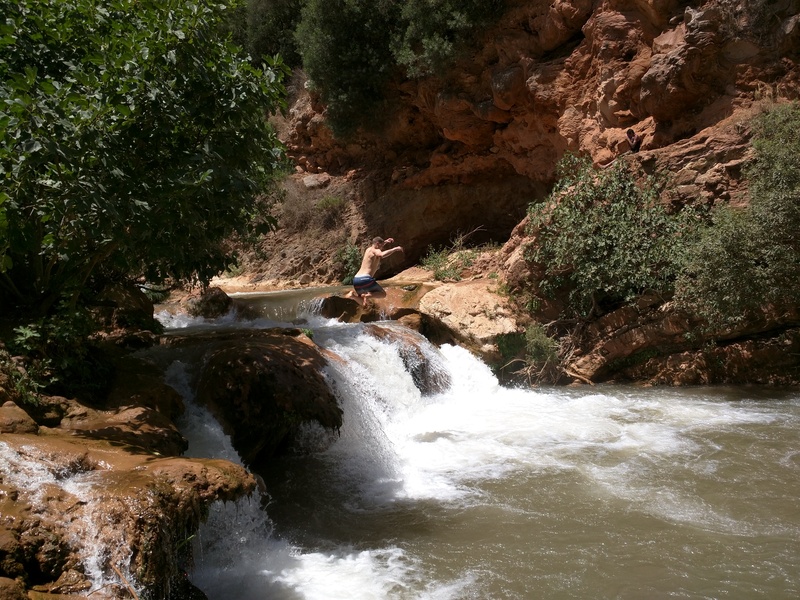 Ouzoud Cascades or Essaouira.